A section of the Atchafalaya Basin, where the Bayou Bridge Pipeline would run through in Louisiana. 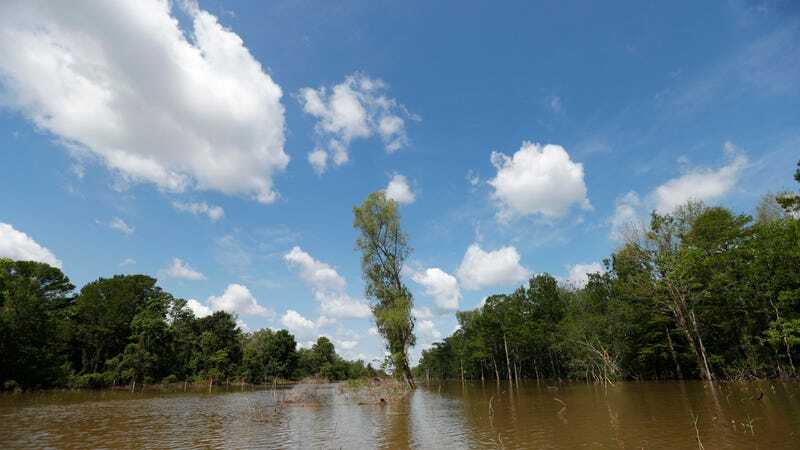 In Louisiana, the Department of Natural Resources (DNR) is disputing a judge’s ruling that it broke the law—all in the name of a crude oil pipeline set to run 163 miles through the state. District Court Judge Alvin Turner ruled last month to pause a key permit the department had granted the Bayou Bridge Pipeline project. That’s because the state failed to require developer Energy Transfer Partners (yes, the same ones behind the highly controversial Dakota Access Pipeline in the Midwest) to create an emergency plan in case the pipeline spills or explodes. But instead of complying, the Department of Natural Resources decided last month to appeal the decision. It’s also allowing pipeline construction to continue where its permit is technically no longer valid, according to opponents. In the department’s view, the courts are wrong and the state is right. This much is clear in a letter dated June 1 that the department wrote to the Tulane Environmental Law Clinic, which is representing the community groups suing the state department. These opponents say the pipeline construction is illegal. DNR’s stance has been and continues to be that the Office of Coastal Management interpreted the applicable laws and rules appropriately and correctly in its review and approval of the Bayou Bridge Coastal Use Permit application. The judge will have final say on the matter. Both parties will make their case before Judge Turner, again, on July 3. The state will argue for a suspensive appeal, which would allow construction to continue while the courts are making up their minds, explained Lisa Jordan, the environmental clinic’s director to Earther. The clinic, on the other hand, will be arguing for the judge to stop any construction in the coastal zone. Jordan told Earther opponents saw construction occurring as recently as last week. Patrick Courreges, the communications director for the department, told Earther it has no legal standing to tell the company to stop constructing. Opposition to the project has been increasing in the last few months as protestors faced arrest, and lawsuits have taken off. The way local environmentalists see it, this is another project that’ll take a toll on the health of Gulf Coast communities. A lot of people simply don’t want it, especially not near or on their property. This department handles coastal wetlands, not evacuation plans, he said. With the motion to appeal filed, the state doesn’t think it’s breaking the law by allowing construction to continue, either. Folks on the other side disagree—on both points. The law clinic believes this evacuation and spill response plan falls under the department’s jurisdiction, Jordan said. “It’s the agency’s job really to enforce the law,” Jordan told Earther. She thinks it’s telling that the state has moved for a form of appeal that will allow pipeline construction to move forward despite court orders. “Why? Why that form?” she said. Her answer? Because the agency isn’t on the side of the people—at least not this time.